Because I am one of the Young Women leaders at church, I had the privilege to attend New Beginnings. If you are unfamiliar with what that is, it is a time when the young women (ages 12 to 18) get together to welcome the girls that will be entering into the program this next year. We had a really nice evening. The girl that was in charge of putting the program together is a very responsible 13 year old. She had everything put together from programs, decorations, speakers, refreshments, etc. After our opening hymn and prayer, we were presented with a nice little story, and then it was on to the Young Women Values. Each of the eight values was presented by a different girl. Faith, Divine Nature, Individual Worth, Knowledge, Choice and Accountability, Good Works, Integrity, and the newest value as of this month Virtue are the values that we are taught to live and be an example of. What a great opportunity for these girls, to be taught these values, and what they should mean in their lives. If each of us, young or old were to live these values, what a better world we would be in! Jesus Christ, our Savior and Redeemer lived each of these values, and we are to pattern our lives after His. 4. Knowledge--We need to "continually seek opportunities for learning and growth." In D&C 88:118 it says, "Seek learning, even by study and also by faith." When we leave this life the only thing we take with us is knowledge, I guess that is why it is so important to learn, and keep learning. Something else that has come to my understanding is that the more we keep our minds alert and exercised, the less likely we will suffer from dementia and Alzheimer's. 5. Choice and Accountability--"I will choose good over evil and will accept responsibility for my decisions." (Young Women Personal Progress). It is so often that when we choose wrong we try to blame it on the other guy. We need to accept responsibility, and consequences of our choices, whether good or bad. In Joshua 24:15 it says, "Choose you this day whom ye will serve;...but as for me and my house, we will serve the Lord." That is a good scripture to live by. I would much rather live with the consequences by choosing to live right. 7. Integrity--what a word! Integrity is much more than just being honest. In the Young Women's Personal Progress manual there is a statement which says, "I will have the moral courage to make my actions consistent with my knowledge of right and wrong." This pretty much sums it up. 8. The newest value is Virtue. It was just presented to the Young Women's program just a few weeks ago. Everyone has really been excited about it. Virtue is huge! In the dictionary it says that virtue is "moral excellence." In the scriptures it says, "Who can find a virtuous woman for her price is far above rubies." (Proverbs 31:10) "Large rubies of high quality are the rarest and most highly prized of all gemstones in the world. Above all other gemstones, including diamonds, rubies command the greatest per carat prices." (http://www.solitaire.com.sg/magazine/feb_mar/story3.html). I grew up with "goodly parents!" I would never trade my family for anything, but one thing I do wish that we would have had growing up, was the Gospel of Jesus Christ in our lives. I remember searching for the right teachings, and did come across many good teachings. The only thing was, I felt there was more. I found more when I joined the Church of Jesus Christ of Latter-Day Saints when I was 19. I did not grow up in Primary or with the Youth programs of the church, but as a parent, have been very happy to have raised my children, and having guildlines such as the ones found in the Young Women's Program. What a privilage these young women have to learn of their importance, and their potential. Don't know if it would have made a difference in my life, but I like to think it might have, to know that I have a loving Father in Heaven, that is always there for me; and that because He loves each and everyone of us, he has given Prophets, other leaders, and the Scriptures for us to learn how we should be living. He has given us the knowledge of what His Son did for each and everyone of us. Christ attoned for our sins. If we repent, and live worthily, we have the opportunity to live with Him someday. Growing up, I was shy, and had a very low self esteem (I was never in trouble, just extreemly shy and quiet). I see so many youth with the same type problems. Some of them aren't shy, but are in trouble because they do not know who they are. It is our responsiblity to share the Gospel with everyone. That does not mean that we have to go up to everyone and start preaching. This does mean, that we need to live our lives so that others will notice, and wonder, and eventually we can share with them why we are the way we are. It is because of Jesus Christ. My husband and I attended a funeral this morning for a very lovely Southern Bell. I met her not long ago, and was very impressed with her. She definitely had the Light of Christ within her. As I sat and listened to the stories that were told about this fine lady, I thought to myself, I would like to be like her. Many years ago, she was a second grade teacher; one that all the kids loved. She was also very active in her church callings. Being a member of the Church of Jesus Christ of Latter Day Saints since 1969, she had many opportunities to serve. She served with young and old, alike. She knew her scriptures well, and was very close to the Savior. I enjoyed seeing her each and every Sunday, walk to the front of the chapel so that she would not miss a word. Our first Sunday in Monroe, we headed for church (not knowing anyone, it is always scary to attend the first time). One of the first to greet us was this fine lady. Just before Sunday School, she approached me and asked if she could sit with me. I scooted over and said, "Sure!" After a few minutes, she asked me to come with her closer...so, I did. A few minutes later she asked if we could move to the front. Very hesitantly, I followed; you see, I am a back row person--I am very uncomfortable in the front. She wanted to sit with me, but could not hear very well, and this is why she wanted to sit up front--to hear every word of the lesson. Her son offered the eulogy, and he told how she died. You see, I don't think she was ill. She did live a long life, though. He told of that morning, how she laid out her burial clothing along with a scripture reference and her funeral requests. She then sat in her favorite recliner, and went to sleep. It was then she left this world. What a special lady. She would have been 87 this August, and will be greatly missed by friends and family. In August of 2007, our family moved to Louisiana. Our furniture came to our new house and the next day school started. Boy, was it ever hectic! We moved from an almost 3200 square foot house; plus we had a whole attic full of storage area, a 2 1/2 car garage (we put our cars in it plus my husband had all his workbench, tools etc in it). The garage also had a storage room with cabinets in the back for extra paint, etc, and we also had a big storage building out back for our yard and garden tools. It was quite the shocker to move our family of six from this to a 2300 square foot house with absolutely NO storage. The reason I tell you this, is because after about 1 1/2 years, we are still unpacking. Just before Thanksgiving, I found a box of yarn and several half done crochet blankets. One was a baby blanket. I finished that one off and gave it to one of my walking buddies granddaughter. It actually turned out quite nice (wished I'd taken a picture of that one). 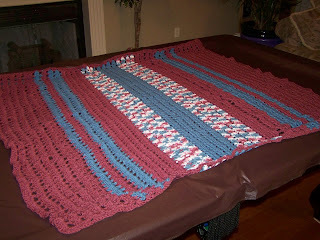 Then I took out the next blanket and promptly started on it. When I ran out of yarn, it still was not big enough even for a lap blanket, so I went to buy more yarn, and found I could not find the blue or variegated yarn I had started out with so many years ago. I had to settle for the pinkish color...not what I wanted. I had to make up the pattern as I went and the above picture is what it turned out to look like. I'm not as pleased with it as the baby blanket I had done. My stitching is not consistent, and it has more pink in it than I wanted. I think, though that my grandma might like it. You see, she is about to turn 90, and her sight it going. Because it is so bright, I think she may be able to see it, so in the mail it will go...off to Colorado for her 90th birthday party. Wish I could be there. My thoughts will be with her. The 3rd of my four children has been gone for the last couple of days on a Beta Club trip. It has been so strange with just one child here--very empty. None of our children are very loud or boisterous, but when one is missing you can feel it. Almost two years ago, our oldest left home after graduating from high school. We were in the middle of moving to another state, and he decided to move in with his grandparents and work and go to school. It was so hard to see him drive out of the driveway, and know he was not coming back. When the next one left, for school this past fall, again, I felt an emptiness (I guess this is one reason it is called the empty nest syndrome). I am so grateful for modern technology. I was never one for text messaging, but since the kids have left, I have become an avid texter. It's almost like they are here (almost...). I can communicate with them anytime I want, even if it's just a "hey! it's 70 degrees today!!! (that is for my daughter in Utah where it's been 20's and snowy everyday). Letting my son go with the Beta Club was not easy. You see, I homeschooled for ten years, and seeing one of my babies go with a group of school kids I don't know as well as I would like, some 5 hours away is not a easy thing for me. He has been taught well, and, hopefully, he will have fun and make good choices while he is gone. I miss his smiling face, his hugs, and his caring thoughts, and am anxious to go pick him up this evening and hear about his adventures! Had a dentist appointment today--not exactly my favorite thing in the world to do, but it is a necessity. I have always been one to REALLY take good care of my teeth, but have never reaped the rewards...bad genes when it comes to my teeth. Anywho...I got a really good bill of health today. Kind of a strange thing, since nothing much changed with my oral hygiene habits. I brush my teeth at least 3 times a day, and I floss every night, and pretty much always have. A year ago, I changed dentist (because we moved to a new state). I was told that my gum's were in bad, bad shape. No new news to me. I got my normal scolding, and went home to my business. After six months, went back to the dentist and the bad spaces improved, but the good places got much worse. Again, I got another scolding. This is one reason I HATE, HATE the dentist, because I always get a scolding. Don't know what more I can do, maybe floss three times a day, too? Don't think that would really help much. I just have bad teeth and gums. By the way a really good book to read is the most recent by Suzanne Somers "Breakthrough, Eight Steps to Wellness". I read it just before going to the hormone doctor, and my dad read it too. He is really into these type books, including the Dr. OZ books, etc, and told me that every woman and doctor needs to read this book. There are some things in the book that I think are a little questionable, but for the most part, it is very good information that everyone needs to know about. This is Sox, our dog, when she was just a wee pup. 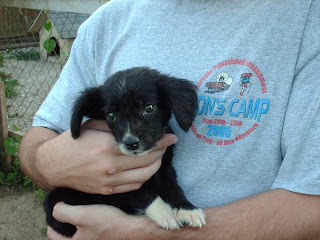 Back in July of 2006, my eldest son's girlfriend asked if she could give him a puppy for his up and coming birthday. Our family had been discussing the possibility of getting a dog, and so I told her maybe. My son knew about this, as he used to go to the dog shelter with his girlfriend (Anna). Anna's aunt had a no kill shelter, and one of the dogs brought in had just had puppies, and my son, Miles, fell in love with one of them. After investigating the mixture of the puppy (Beagle, Basset, Spaniel, Australian Shepherd), we told them that they could bring it over for the weekend and we would make a decision. The second they came in with this cute little puppy, everyone fell in love, there was NO turning back, and she has been a part of our family ever since. I really like spending time with my mom. Whenever we get together, whether it be in person or on the phone, we never run out of things to talk about. My kids, my sister's kids, past cruises, cruises we hope to go on in the future, other family members, or just stuff, are some of the many topics we like to discuss. My parents came for a visit recently. They came for Christmas, then went out to Colorado to visit with my extended family. They especially like to check up on my grandma (my mom's mom) who is in a nursing home. Grandma will be 90 in February. On their way back home, my parents stopped by our house for a week. My mom and I discussed many things, but especially a problem that many of us are having--belly fat. Even people who are thin seem to have some belly fat. What do you think it is? I have my idea...and that is what is being put into our food. Now, I know most of us do not eat right, but I know people who are doing a very good job of eating and exercising like we all should, and still have some belly fat. I use the excuse that I've had four children, but that is all it is--an excuse. Mom and I set up a program with the help of a new book that is out--The Flat Belly Diet. I've heard some poor reports about it, and some good ones. As we read through those who did not like it, it came to our conclusion that many did not read the book. We gave it a week, and I lost 2 lbs, and Mom lost 4; and that was with little exercise. I usually walk everyday, and Mom goes to the gym everyday, but since it was in the 20's and 30's each morning, we did not bother to walk. We were pretty excited about our success, and hope that it continues. Next week the weather is suppose to be much better for walking, so I am hoping I have another week of success. My mom will be back to the gym, so she is hoping for the same. Besides talking about belly fat all week, we also did some shopping (did not buy much at all). We also went out for lunch. I like going to lunch with my mom, and also my daughter, because we always split everything. The portions are just too big, so when we go, we get one entree and split it--it is always plenty of food. Early this morning, my parents left to go home. I will miss my parents, but am glad for modern technology, as I know they are always just a phone call away. I've been a little busy these past few days because my mom and dad are here to visit. They will be leaving in a couple of days, and I will be very sad, but for now, Mom and I are enjoying our time together. Yesterday we went to the mall and out to lunch. We wound up a Applebee's and tried one of their Weight Watchers meals. Cajun-lime Tilapia. It was really yummy, and there was quite a bit to eat. It was suppose to be 310 calories. The tilapia was coated in cajun seasonings and grilled, topped with a salsa made of black beans, corn and tomato. The fish was served over a small bed of rice. On the side was a delicious serving of broccoli. After our lunch we headed to the mall. Before we shopped, we took a brisk 30 minute walk. We really did not buy too much. Mostly looked around and talked. Mom and I like to talk. We have been dicussing how to best loose some weight. She has been using the Flat Belly Diet Book, which has some really good ideas and recipes. I've been looking into it myself, in fact, I bought the book yesterday, because we have been cooking out of it this week, and so far, I like everything we have tried. It follows the LA diet pretty closely, but seems easier because you have four, 400 calorie meals daily. I've actually lost a little bit of weight this week, and that is with going out to eat for lunch two times. I may be switching over to this program. The cold weather has returned. I am not really a cold weather fan, even when it snows. I've lived all over the place in all different kinds of weather, and, by far, I like it warm, even hot and humid does not bother me as much as COLD. Thankfully, cold weather does not last long here in Louisiana. My daughter left for Brigham Young University (Provo, UT) in August, and they have been getting a ton of snow. I do remember the days when I was out there. Coming from Florida and only seeing snow once in my life, it was quite the novelty. I did not have to worry about whether or not my car was going to start, or whether I could even get anywhere in my car, as I did not have one. I lived practically on campus, so getting places was not difficult. The snow was beautiful on the mountains, so I guess you could say, I enjoyed the snow while a college student in Provo. We lived in Indiana for over five years before we moved to Louisiana. The first snow of each year was pretty exciting. You do have to admit it was a beautiful sight to see the flakes slowly drifting down to earth; looked like Heaven was having a pillow fight. But...once it came and stayed, one gets tired of it very quickly. Especially when it becomes icy and treacherous. This morning, I got up and made breakfast for everyone. As I ate my eggs, I planned out the rest of the days food intake. Even though I am not physically going to LA Weightloss, I am doing it at home. I was successful with it at one time, and since I have all the info, have decided to do it on my own. I have the cookbook and was going through it and came across this recipe. It is YumO! (As Rachael Ray would say). Here is the recipe that serves two. If you are on the LA program, it counts as 2 vegetables, 1 starch, 1 dairy. I doubled the recipe and divided it and put into freezer containers for the future. I also used the left over ingredients and made one for the rest of the family. One thing that I don't like about some recipes, is that you have left-over ingredients. For example with this recipe even though I doubled it, I still had left-over tomato sauce. As I was taking it out of the oven, everyone was complaining because it was "diet" food, but when I started spooning it out, they crowded around with their oooo's and awwww's. Hope you enjoy it as much as we did. 1. Coat skillet with nonfat cooking spray; heat over medium flame. 2. Add onion, garlic, and carrots to skillet and saute 1 to 2 minutes, or until onions begin to soften. 3. Add mushrooms, zucchini, and garlic powder, and saute 2 minutes. 4. In large mixing bowl, combine ziti, ricotta cheese, tomato sauce, and vegetable mixture. Add spinach and cook until wilted. Remove vegetables from heat and set aside. 5. Coat casserole dish with nonfat cooking spray. 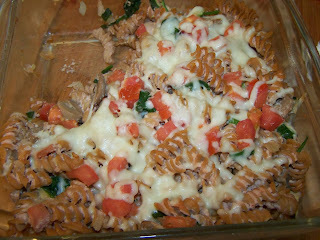 Pour ziti mixture into casserole and top with diced tomato. 6. Cover and bake in 350 oven for 20 minutes. 7. Remove from oven and top with mozzarella cheese. Bake, uncovered, 10 minutes, or until cheese is melted. Something I enjoy doing everyday is walking. I especially like walking on the beach, but since I live in Northern Louisiana, I have to settle for walking in the neighborhood. Our family moved to Louisiana about 1 1/2 years ago. One morning, as I was in the process of unpacking, the doorbell rang. I opened the door to find two ladies who welcomed me into the neighborhood. I learned that they had a walking group and I've been walking with them ever since. Every morning at 8:30, I meet with these ladies in the neighborhood for our walk. Sometimes there are four of us, sometimes maybe just two, but unless it is raining, you will find us walking and talking, and solving the problems of the world. We are known in our neighborhood as "The Walkers". Walking with someone else, makes you feel obligated, which is a good thing. We walk for about 1 to 1 1/2 hrs each day. We have a fairly large neighborhood--about 500 homes and growing. We usually walk about three to four miles each day, depending on whether or not we get side tracked. Sometimes we like to stop and check out one of the homes that is being built. Exercising each day with these ladies has not only helped me to feel better about our move, but also to feel better about myself. I am finally on an exercise program that I enjoy and fits into my life. Each morning I take my 15 year old son to Seminary. I roll out of bed at 5:30 a.m. and we leave at about 5:55 just in time for his 6:15 class. This year they are studying the New Testament. We live a good 20 minutes away, so I really don't have time to go home, so I sit and wait. During this time I eat my Slimfast and yougart. After my breakfast, I read my Scriptures. Today, I finished Isaiah--actually I read the book Isaiah Made Easier by David J. Ridges. I don't know about you, but I've always had a hard time with Isaiah, and this book made it a little easier to understand. Something I have been struggling with for the last several years, is my weight. Until I hit the child bearing age, I never really had a problem with my weight. When I was younger, I ate healthy, and was active. I was always heading to the beach, swimming in our backyard, or off to dance lessons. In college, I was a dance major, eventually wanting to use my dance background to assist others through therapy. Dancing about eight hours each day and being involved with dance teams, I kept myself in good physical condition. Once I got married and started having children, my lifestyle changed. All of the sudden, I was a stay at home mom. I had every intention of putting in that video and working out, or talking walks with my little one. I would start, then for one reason or another, I'd quit. Soon, I had another child (17 months and three days later), and it made it even harder to find time to work out. Within six years from having our first child, we had four little ones. Boy, was I ever busy! You would have thought I would be skinny as a rail, but nope, I was not. 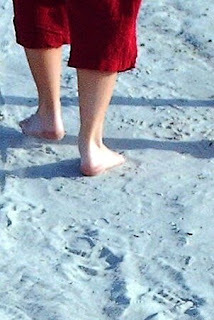 I was not extremely heavy, but my size three was going forever. Dance, karate, baseball, soccer, and eventually home schooling kept our household very busy. I did take tap lessons for several years, and enjoyed that greatly; but the weight never came off. Once the kids got to a point where I could leave them for a short time, I looked into several weight loss programs. There are a lot of good programs, but finding the one that fits your lifestyle and your budget is hard to do. I finally found the right one. It was a bit pricey, but I told myself that if I did not do something soon, that I may be setting myself up for medical issues, and that would be really pricey. I started Jan 2005 and by April, I had lost 30 lbs! I was so happy. The end of May we went on a seven day cruise, and I didn't even game one pound! I saw some of my old college friends, and they couldn't believe how good I looked. I not only looked good, but I felt wonderful! I really don't have many bad habits. I only drink water, we don't do fast food (unless we are traveling, and sometimes we try to bring our own sandwitch stuff), and we don't have chips, cookies, etc. in the house. I also walk briskly for about 1 to 1 1/2 hours each day. My downfall is...pasta. Yes, I am a pastaholic, so, I will be cutting this out of my menu. Today, I am heading to the grocery store. I have made my menus and made my list, and I am off to the store for the hunt of healthified food. I am 49 (yes, I turn 50 this year--ugg), been married for 25+ years, and have four wonderful children that keep me busy. We have lived all over the place, and hope to someday settle in either Tennessee (where my husband grew up), or Florida (where I grew up), but for now, we are making our home in Northern Louisiana. In August of 2007, we moved from Muncie, Indiana with three of our four children. Our oldest son, had just graduated from high school, and moved to Tennessee to live with his grandparents, work and go to school. Our next oldest--our only daughter--also had just graduated. She had been home schooled for most of her life, and started college at age 16; so, when we graduated her from high school, she already had 15 credits under her belt. She was still only 17, so she moved to Louisiana with us and attended the local university, majoring in film and minoring in dance. Besides my husband and children there is one other thing that is very important in my life, and that is my Savior, Jesus Christ. We are members of the Church of Jesus Christ of Latter-Day Saints, so this is a big part of our life. I have gone through several difficult times in my life, and I know that there are difficult times to come. I am thankful that I have Jesus to turn to. He will always be there for me and my family. Well, I hope all who read my blog will enjoy what I have to say. I will be blogging on everything from family, homeschooling, trying to adjust to different seasons of my life, and so forth.